Gatchina Palace is a remarkable complex located in the eponymous Russian city, located 42 kilometers from Saint Petersburg. Gatchina Palace is undoubtedly the biggest cultural and historical landmark of this city in Russia. Gatchina is a precious architectural monument of the late 18th century. The original construction of the palace was designed by architect Antonio Rinaldi in 1770, but twenty years later, in 1790 the castle was rebuilt by Vincenzo Brenna. The spectacular interior of the Great Hall remains virtually intact from its original face to the Second World War, when a huge fire destroyed the aristocratic atmosphere of the room. After this huge fire, the restoration of the palace Gatchina began in 1976 and is continues to this day. Gatchina Palace is situated on a hill, which is over the Lake Serebryannoe. Architecturally, Gatchina Castle combines motifs and elements of medieval castles and typical Russian imperial construction elements. The interior of Gatchina is an excellent example of Russian classicism of the18th and 19th century. 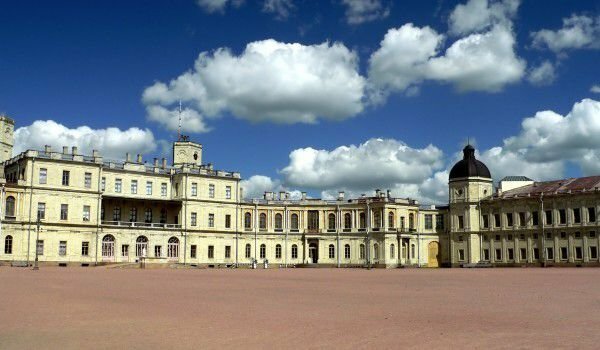 Gatchina Castle was at the time one of the favorite royal residences, in fact it was built by Catherine II for her favorite, Grigori Grigoryevich Orlov. The main ceremonial hall of the palace Gatchina was completed in 18th century. Unfortunately until now it has remained very limited for information about its original design. The whole room is located in an area of 55 square meters. Once the walls of the Great Hall of the Gatchina Palace had hung huge pictures of the picturesque collection of Count Grigory Orlov, who resided in Gatchina during the year of 1778. Until today, the original parts of this room that have remained is the large door, which is remarkable for its decoration of pink-orange marble. The floor is decorated with ornaments of exotic flowers and the ceiling has a picturesque image of Mars, which bows down before the goddess of war Belon. Another striking room in the Gatchina palace is the marble dining room, which occupies an area of 110 square meters. Once it had been used for gala dinners of the Russian noblemen. This hall of Gatchina is impressive with its large marble columns that stand on its periphery, and with beautiful plaster ornaments, once decorated with gold trim. The plaster on the walls of the marble dining room depict the ancient Greek times to the god Dionysus. This premise of Gatchina was used for lavish dinners for the royal family. It is decorated with marble miniatures and Italian sculpture of Eros, dating from the 18th century and decorative vases, which are Russian and Italian dating from the end of XVIII century.